Nigerian Army inspects Innoson Motors. Just about two weeks after his arrest and detention, Innoson Motors CEO - Innocent Chukwuma is stepping on higher ground. The Economic and Financial Crimes Commission (EFCC) released Chukwuma on December 20, 2017 after 24 hours in detention. Chukwuma may have put that behind him as he has entered into a partnership with the Nigerian Army to modify some of its equipment, produce armoured fighting vehicles and other military hardware. Innoson Motors supplied the army three armoured vehicles which were deployed in the north-eastern region to fight Boko Haram. Following satisfactory performance of the vehicles, Chukwuma, chairman of the company, on Tuesday led his team to the army headquarters in Abuja to meet with chief of army staff, Tukur Buratai. 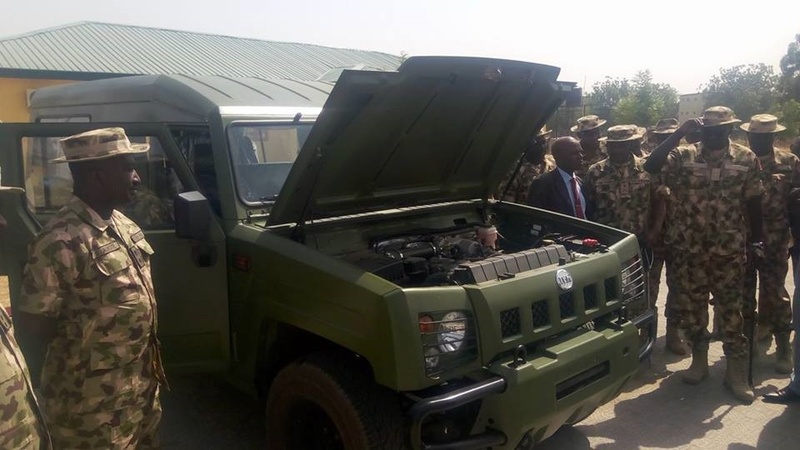 “The Nigerian army, being patriotic, and in a bid to encourage local entrepreneurs asked Innoson Motors to supply three vehicles early last year which were found to be durable,” Buratai said. “They were deployed in combat and proved to be useful, comfortable and convenient in military operations. Chuckwuma thanked the army for it’s great sense of patriotism. There was also inspection and handing over of three of the newly manufactured vehicles by the company to the army for trial. The vehicles are IVM G80 Bigger Jeep, IVM G40 Smaller Jeep and IVM Granite Pickup.